These guitars may even be a little pricey for 1976. Be aware that the guitar industry was in pretty deep trouble in the 1970's & 80's. Gibson almost went under. Hell of a time to start a guitar company in Vermont! and Back. Also available in Wine Red and Cherry or Tobacco Sunburst* Finish. Alan may have thinking of legal action from Leo Fender at the time when he called his bolt-on guitars 'Time Kasters'. Here is the GS 'Time Kaster'. Indeed the later TimeCaster is a very different guitar then the Watlham GS Time Kaster. It's model ID is 'TC" and the brochures at that time verify this. It's interesting that the price list is calling out the single coil pickup. I have never seen a Time with single coil pickups from that period. Except for the 1st GS with the P-90 pickups. Also Johnny Moore's & Steve Nolan's guitars have a 3rd [middle] single coil pickup. I always thought these pickups were DeArmond pickups but have found that Schaller was producing these pickups in the early 70's. This Schaller connection really makes sense if you look at the part choices Alan was making in 75. Bill Lawrence was at Gibson starting in 1971. He designed the the Gibson L6-S, the S1, and the Marauder guitars all before 1975. These guitars all use the Schaller Harmonica bridge [and the rest of the hardware] that Alan choose. 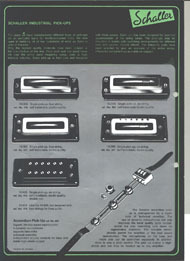 Bill Lawrence was an innovator with his pickup and wiring designs during that period. Alan has told me that he held him in very high regard.